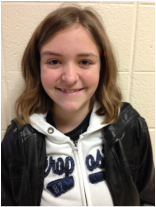 Congratulations to Katie Miller on making the 2014 Southern Division ACDA Honor Choir! Western Hills High School choral students have the opportunity each year to audition for the American Choral Directors Association Honor Choirs. This process includes preparation of a standard piece of vocal literature and singing scales. For March 2014 the students will be auditioning for placement in one of the honor choirs at the Regional ACDA Conference in Jacksonville, Florida. Go the ACDA website to check out more information about audtioning and participating in the convention.